Janáček is surely the perfect, or at least a perfect, composer with whom to introduce someone to opera. Starting with From the House of the Dead or The Adventures of Mr Brouček might be a little odd, if hardly disastrous. However, Jenůfa, The Makropulos Case, The Cunning Little Vixen, and Katya Kabanova all boast compelling, readily comprehensible stories, strong characters (especially female ones), and textbook demonstrations of what might be accomplished by musical drama, even in something that might superficially seem close to a sung play (in itself no bad thing for a beginner). Last but not least, they are not a second too long, showing unerring mastery concerning what need be depicted, even lingered over, and what may be assumed or suggested, without the slightest chance of having anyone wonder ‘when will this be over?’ Loving them, one might wish that they were longer, but one also knows that they should not be. For devotees of late-nineteenth-century literature, Jenůfa and Katya would seem the most obvious choices. (Not that Wozzeck would do any harm: it gripped this sometime schoolboy for life…!) Setting, narrative, and character stand in well-nigh perfect relation to one another: familiar, yet fresh. Why, then, have London houses seemed so reluctant recently to stage these operas? Xenophobic audiences, bizarrely lacking in curiosity? Most likely, alas; we live, after all, in the age of ‘Brexit’. Whatever the reason, we have all the more reason to cheer the Royal Opera’s commitment, following years of silence, to staging a number of Janácek’s works. 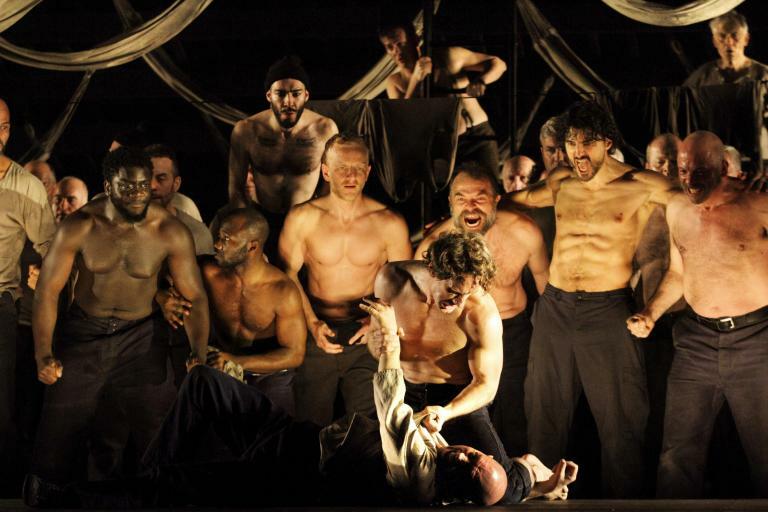 Last year’s From the House of the Dead, in a striking, duly provocative staging by Krzysztof Warlikowski, was unquestionably a highlight of the London musical year. (If, later in the year, Munich’s offering from Frank Castorf went further, all the better for us. How fortunate we were to have both.) Richard Jones’s new Katya is not at that level: a ‘safer’ choice, no doubt; nor is it so well conducted. Nevertheless, a cast as strong dramatically as vocally brought out the best in work and production alike. Without really getting in the way, Jones’s staging is mildly puzzling: a mix of good ideas, oddly undeveloped ideas, and all-purpose Richard Jones, almost as if it were an early sketch rather than a finished production. We begin and end with a portrait of a girl, Katya presumably, and there is something intriguingly doll-like to her appearance onstage, even to some of her gestures. Three men from the community – beyond that, it is barely a community – leer through the windows at her. It is sketchy, though: neither subtle nor thought through. The 1970s Eastern bloc setting is fine, if hardly original, but not much is done with it. Nor is it clear why abstraction is occasionally the order of the day: budget limitations seem more plausible as an explanation than dramatic motivation. Auditorium strobe lighting for the storm that opens the third act is an odd touch: neither in keeping with what has preceded and what will follow it, nor productively in contrast. A degree of stylisation on stage works much better, cinematic ‘still’ moments suggestive of contrasting chaos and a moment of fateful decision. That particular aspect of the setting, too, is excellent – a wonderfully ‘real’ bus shelter, which again has much to offer in metaphorical suggestion. More along such Brechtian lines might work well; all too soon, however, it is gone. Sadly, Katya’s talk – song – of sin is left to fend for itself. It still moves, of course, but would have done so far more in a production that deigned to notice it. For, despite the ‘updating’ – the slightly retro term seems apt here – socio-cultural context is barely present, at least as anything more than backdrop. It is perfectly possible, I am sure, to present a Katya Kabanova with something to replace the theology, just as it would be with Don Giovanni. Whether it is a good idea remains an open question, for here, as so often with Mozart’s deeply Catholic opera, the issue is simply ignored – or, worse, is not even noticed. Likewise, Kabanicha’s terrible words of thanks at the close could hardly fail to register; they could – should – nonetheless readily register far more strongly, set in social and theological context; or, alternatively, in its provocatively avowed absence. As Schoenberg once noted, it is only the middle road that fails to lead to Rome. That such crucial moments did register was the cast’s achievement (as well as Janáček’s!) Amanda Majeski’s Katya was a towering performance: fearful, compassionate, human, with as impressive and moving an emotional as a dynamic range. Pavel Černoch fully lived up to the expectations I had from his Munich Makropulos Case (as Albert Gregor), his romantic ardour as genuine as his courage was but flickering, a properly compromised portrayal. Andrew Staples drew out the still more compromised, indeed downright cowardly nature of his not-even-rival, Tichon. Susan Bickley rescued her Kabanicha from mere caricature, hinting at a constraining force of social propriety that might – just might – explain or at least contextualise a little of her monstrous, constructively murderous behaviour. Clive Bayley’s Dikoj offered a quality cameo as Dikoj. If only the sado-masochism in his relationship with Bickley’s Kabanicha hinted at here had been taken further by Jones, there might have been illumination such as that gleaned from Christoph Marthaler’s production for Paris. Emily Edmonds and Andrew Tortise gave lively performances as Varvara and Váňa respectively, the latter’s second-act song winning in its diegetic naïveté. Edward Gardner’s conducting had its moments. They tended, though, to be moments – at least until the third act, undeniably possessed of great narrative thrust. The intricate, complex relationship between continuity and discontinuity in Janáček’s score is not at all easy to bring off. Mark Wigglesworth did so magnificently at ENO nine years ago. Here, whatever its warmth, there was something soft-focused to too much of the Orchestra of the Royal Opera House’s playing. Rhythmic bite was not quite what it might have been, nor were underlying harmonic motion and tension. If the achievement of that final act could have been read back into the first two, something more taut and stark in its tragedy could well have resulted. In a way, then, it complemented Jones’s staging. Vocally, however, this was the real thing.